I am exhausted after this weekend. We have been pushing hard in the last few weeks, racing every weekend and it wears on the body. Jason is hanging in there but ready for a break. 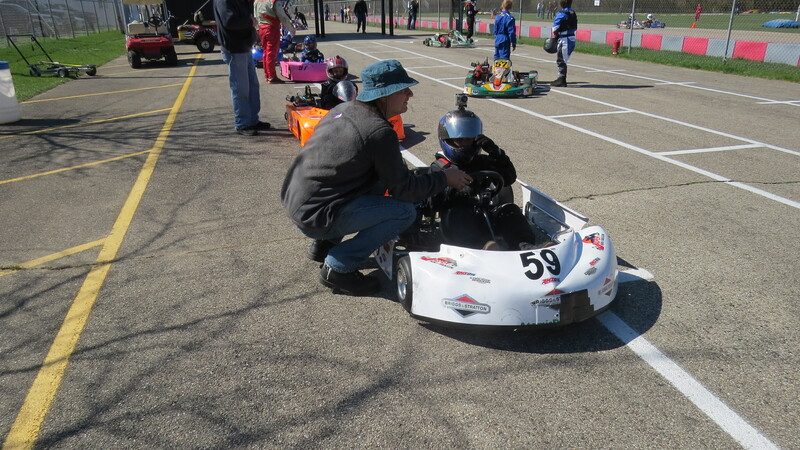 Last Sunday we drove up to Badger Kart Club for their first race of the season with the plan of running both karts and to trying to redeem myself from the last trip. My Dad came along to help out and cheer for Jason. He managed to get some fun pictures of Jason and I working together. It is always nice to have more family hang out with us the company is good and the extra hands always help. There has been a real change in Jason in the last few weeks. He as started to take care of himself at the track, making sure he eats, drinks, and is ready for sessions, with a more conscious attitude about driving and what his goals are. He is still having fun but is now also taking enjoyment in the hard work that is starting to make him more successful. Badger now only has one practice session before racing, which makes tuning for the day a bit tricky. After practice, I made some very quick guesses and adjustments to the karts to get them both ready for qualifying. Jason did very well in both qualifying sessions, getting second in the LO206 and 3rd in the Animal. Our friend Riley (#91) took the pole in both. She has really gotten her karts sorted out and was running very fast. Camden (#57) was just behind Jason and ready for a chase. From this point on until the end of the Animal pre-feature Jason was hanging out track-side wearing most of his gear, often still in his helmet, and watching races and chatting with his race buddies. The LO206 Pre-Feature was very exciting with Riley, Jason, and Camden staying out in front and racing hard. Jason dropped back at first but caught up to the front two as they fought for first. Jason managed to catch and pass Camden coming out the hairpin and beating him to the top of the boot. Jason raced to the finish with a great 2nd place run. The only down side was, the front body mounts failed and needed to be repaired. I started working on that and put together a repair plan, and then went to get the Animal ready for the pre-feature. The Animal kart is not quite tuned right and I am still struggling to get the gearing and handling right. Jason started in third and stayed there, dropping back from the leaders but not losing ground from the rest of the pack behind him. The kart is still pushing in the front and needs some more fine tuning. After the race I finished repairs on the 206 kart and made a gear change to both karts, hoping for a little more speed. The LO206 Feature started with me running to get tools to tighten the motor mount then more tools to tighten the motor mount nut, so many things to check. With that taken care of they were off for a spectacular race between 4 drivers – 3 sportsman and a senior, each of the them swapping places repeatedly until in the closing laps the senior pulled out front and the Camden, Riley and Jason battled for 1,2, and 3. Then Camden got in front and pulled away, leaving Riley in second and Jason in 3rd. In the last lap Jason managed to pull out of the tree turn on the inside of Riley and pulled alongside. It was a drag race to the finish! Jason just beat Riley by just 1.5 hundredths of a second. Wow! What a great race. The Animal race did not go as well. He started in third and fell back quickly. Will, #43, was pressing Jason for a pass. At about 4 laps into the race, out of the tree turn, Jason’s motor died and he pulled into the pits. The spark plug wire had come loose. There is still so much work to do on that kart just to keep it running. Though he took this DNF with more grace as he understands that these things happen. It would have been nice to get both karts to the finish line, but we could be hit by random problems anytime. Right now, the kart problems are a bit self induced along with random failures. The driving is getting better and better. Once I get these karts roaring along he should be able to fly. 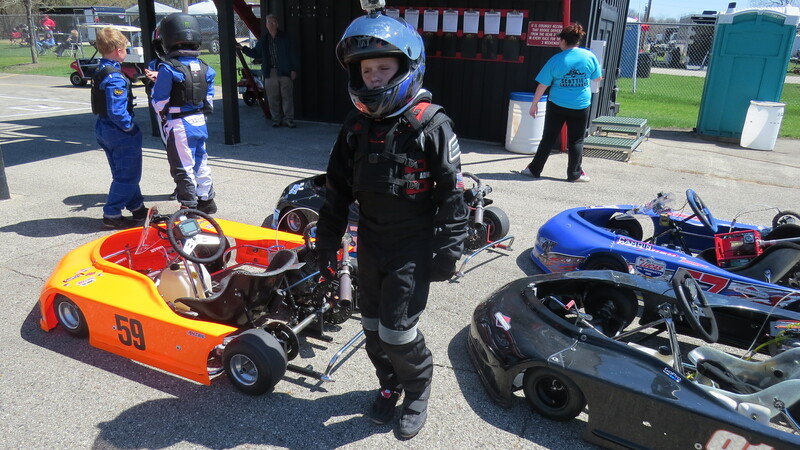 The next race is at K1 Speed race 4 on the 5th, after that it will be MASS Race 2 at Badger May 16th and 17th. In the meantime we will be taking some much needed time off and testing with the Animal kart. Welcome to EVS as our newest sponsor. They had a neck collar that actually worked for Jason and keeps him safe.